What exactly does Income Protection cover? 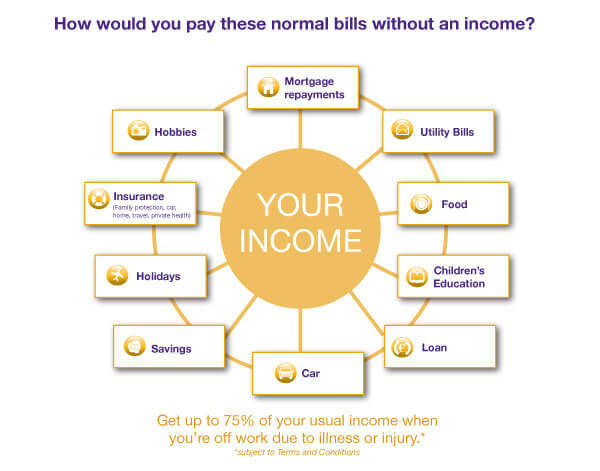 Income Protection can replace up to 75% of your usual income less any social welfare payments when you’re off work due to illness or injury. You pay a monthly premium determined by your age, occupation and health status. If you are absent from work due to illness or injury, Friends First provides you with a replacement income after a deferred period which is chosen by you at the outset of your policy. You will be paid until you return to work, or until your chosen retirement date if you’re not fit to return to work before then. Why would I need Income Protection? If you do not have an alternative source of income, how would you maintain your lifestyle? In 2015, the State Illness Benefit amounts to just €188 per week. Could you survive on this? Income protection helps take care of your financial needs while you are focusing on recovery – a time when money worries should be the last thing on your mind.